The LMD-A170 17-inch LMD-A Series LCD monitor offers Full HD resolution, along with a lightweight and compact design. There is more than a 12% to 22% reduction in mass, 30% reduction in depth, and more than 25% reduction in power consumption, compared to Sony’s previous models. The LMD-A Series offers the same user-interface design, convenient features, functions and operability as PVM-A Series OLED picture monitors. This consistency between the PVM-A and LMD-A Series brings great user benefits when both types of monitor are used in the same network. Furthermore, LMD-A Series monitors provide versatility for a wide range of user applications both in the studio and in the field. These include DC operation, VESA mount and yoke-mount holes, and an optional protection kit. 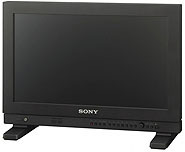 Incorporates a 17-inch Full HD (1920 x 1080) LCD panel and emulates broadcast standards (ITU-R BT.709, EBU, and SMPTE-C). Provides an AR-coated protection panel for the 17-inch monitor, along with corner bumpers to safeguard the monitor from scratches and impact in the field.